Have you ever wondered if there is a limit to the number of fillings a single tooth can receive? Although this number varies from person to person according to the overall health of the individual tooth, extensive repairs can leave a tooth unstable, which can cause painful fractures later. To strengthen the tooth and protect it from further damage, our dentists might recommend a dental crown, which is essentially a cap that is cemented over the existing tooth. To Improve Aesthetics: Dental crowns can also be used to correct the cosmetic appearance of the tooth. For example, if you have a tooth that is severely discolored or ravaged from years of decay, a dental crown can cover discoloration, previous repairs, and cracks. To Secure Bridges: Dental crowns can also be used to support full or partial dental bridges. Some bridges require the support of a single crown on either side of the repair, while others simply hold a single tooth to improve the look and function of the teeth. To Change The Shape Of Your Tooth: If you have a tooth that is unusually small or misshapen due to an injury, a dental crown can be used to reshape the tooth. To Cover Dental Implants: Dental implants are supported by an abutment that is anchored into your jaw bone. Solid dental crowns are used to cover this abutment and provide the tooth part of the implant. Base Metal Alloy: Composed of a mixture of different metals such as silver, nickel, chromium, and palladium, base metal alloy crowns are durable against impact and resistant to corrosion. 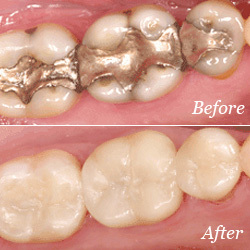 However, since base metal alloy crowns are silver colored, they are better used for molars or other back teeth. Porcelain Fused To Metal: Porcelain fused to metal crowns are base metal alloy crowns, with a thin porcelain layer to make the crown tooth-colored. These crowns are less expensive than ceramic crowns, but tend to look less realistic—sometimes showing a dark line of base metal along the gum line. All-Resin or All-Porcelain Crowns: All-resin crowns are composed of composite materials. These crowns are completely natural and tooth-colored, which makes them perfect to replace visible teeth. Ceramic crowns are the most expensive type of dental crown, but they ideal for people with metal allergies. Typically, getting a dental crown involves multiple trips to the dentist to inspect the area, prepare the tooth, and get the permanent crown installed. While we still offer traditional crown placement, Dental Excellence also offers CEREC crowns. These types of crowns are milled on-site, so that you won't have to wait for a permanent version of your crown. However, if you wish to receive a traditional crown, the process is still quite simple. After one of our dentists has determined that you need a crown, the area will be checked extensively for decay. X-rays will be taken of your teeth to see how deep the infection goes, and how stable your jaw is. If you are a good candidate for a crown, the area will be numbed and the actual tooth will be filed down slightly to accommodate the space for the new crown. After the tooth is reshaped, an impression will be made of the area. This impression is used to create your new crown, so that it fits perfectly. An impression will also be made of the teeth above the restoration, so that your bite lines up properly. After these impressions are taken, the dentist will install a temporary crown over the filed tooth, and your impressions are sent to the lab where your crown will be made. When your crown is complete, you will be asked to return to the office to have it permanently installed. With proper care, dental crowns can last between 5 and 15 years. However, some patients report that theirs have lasted much longer. Teeth that have dental crowns don't require special care other than proper brushing and flossing, although the area does need to be monitored closely for signs of trouble, such as pain, infection, chipping, or looseness. Also, since the core of the tooth is still your natural tooth, teeth with crowns aren't immune to issues with gum disease or periodontitis. If you suspect any type of problem with your dental crown, make an appointment to have it checked as soon as possible. If you think that dental crowns sound like something that could help you, contact Dental Excellence today to schedule an appointment. We are located in Independence, Missouri, near Blue Springs and Lees Summit.